In a casual but elegant manner this small piece of furniture tasteful accents all home interiors with its plain and stylish look. 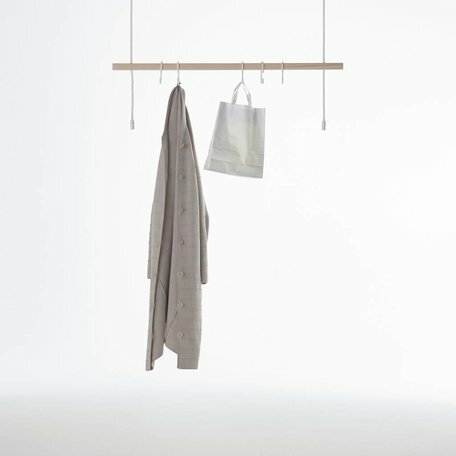 Placed in the corridor or sleeping room clothes and bags can be hung upon Feiner Strick both with common cloth hangers or with the optional hook set. 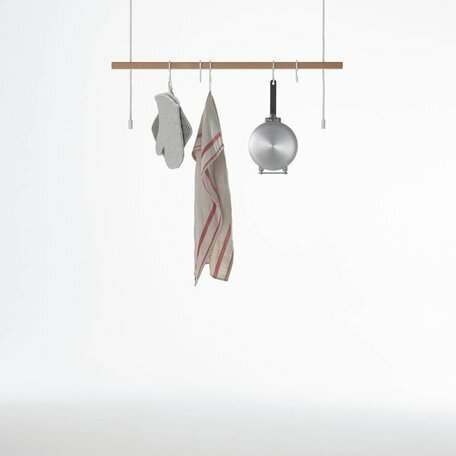 Suspended in the kitchen cooking utensils and kitchen linens are staged in an eye-catching way. The unobtrusive linkage underlines the reserved product character. Displayed are the things that hang on the partition. In different combinations Feiner Strick comes up with imaginative arrangement possibilities. The plain wooden rails can be installed around a corner or in steps one after another. The adjustable mounts hereby allow individual and very precise intervals. Feiner Strick stands out through its simple and modern design: Striking equally in private homes and boutique display windows.